Consider a fast and friendly professional resume writing firm that will focus on getting you results with personal, one-on-one service. Our resumes are without a doubt - POWERFUL. COMPELLING. JOB-WINNING. Every resume is unique, custom-designed, and beautifully written. 100% guaranteed to facilitate your job search and help you reach your career goals. 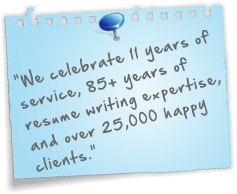 Our resume writing guru’s, will work with you to showcase your achievements and help you stand out. Our resumes are keyword rich and have all industry terms and buzz-words to get you noticed and found! We specialize in executive-level resumes, mid-career professional resumes, IT/technical/engineering resumes, and entry-level resumes in all areas and industries. CONTACT US FOR A FREE CRITIQUE of your resume, guaranteed within 24 hours. From cover letters that open doors to resumes that help you land the job you've been waiting for, Shark Resumes is a one-stop career resource providing exceptional results at affordable rates. "Take advantage of our FREE resume evaluation!" I am beyond thrilled with how this turned out!